Showing items in category Burma, sorted by newest listed first. 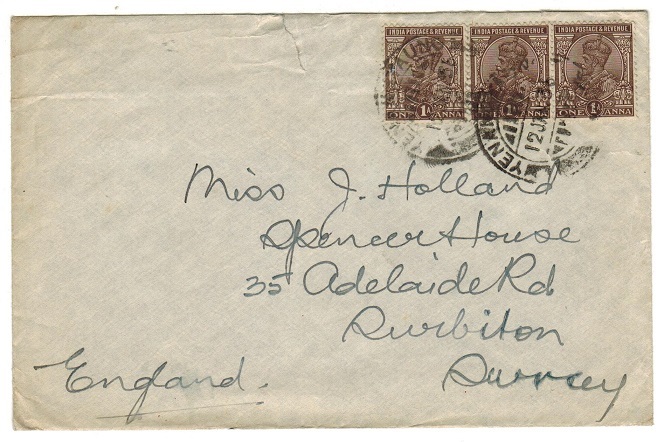 JAMAICA - 1942 'MILITARY CENSOR Y FORCE No.8' cover to Canada with unusual patriotic air label. 1942 (JNE.10.) 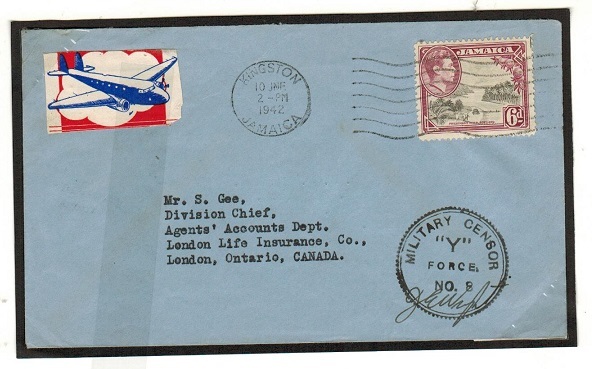 cover addressed to Canada bearing 6d adhesive tied by KINGSTON/JAMAICA roller strike with scarce red, white and blue 'patriotic' air label at left and struck by black cog wheeled MILITARY CENSOR/ Y-FORCE/No.8 handstamp below. 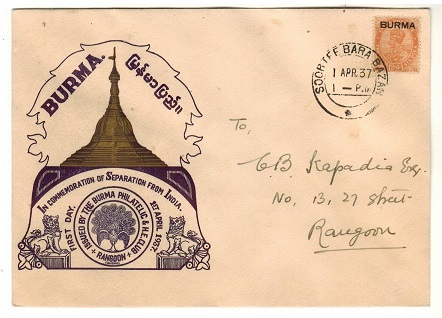 BURMA - 1937 3a6p rate 'In Commemoration Of Separation' cover used at SOORTEE BARA BAZAR. 1937 (APR.1.) illustrated 'In Comemoration Of Separation from India' cover addressed locally bearing GV 3a6p adhesive tied SOORTEE BARA BAZAR. 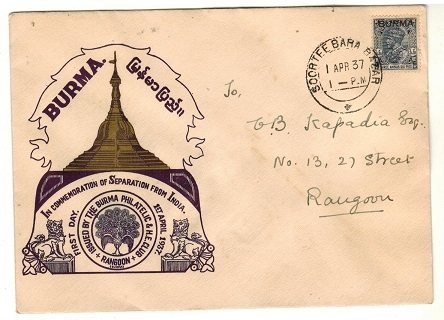 BURMA - 1937 3a rate 'In Commemoration Of Separation' cover used at SOORTEE BARA BAZAR. 1937 (APR.1.) illustrated 'In Comemoration Of Separation from India' cover addressed locally bearing GV 3a adhesive tied SOORTEE BARA BAZAR. BURMA - 1937 2a6p rate 'In Commemoration Of Separation' cover used at SOORTEE BARA BAZAR. 1937 (APR.1.) illustrated 'In Comemoration Of Separation from India' cover addressed locally bearing GV 2a6p adhesive tied SOORTEE BARA BAZAR. 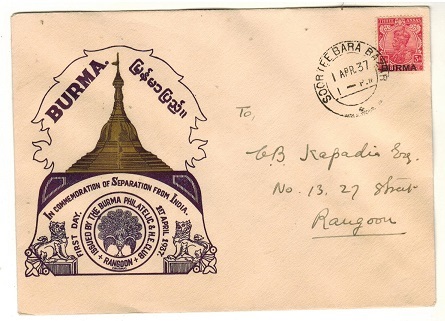 BURMA - 1937 2a rate 'In Commemoration Of Separation' cover used at SOORTEE BARA BAZAR. 1937 (APR.1.) illustrated 'In Comemoration Of Separation from India' cover addressed locally bearing GV 2a adhesive tied SOORTEE BARA BAZAR. BURMA - 1948 local registered cover with 3a6p block of four with INVERTED OVERPRINT. 1948 (NOV.1.) 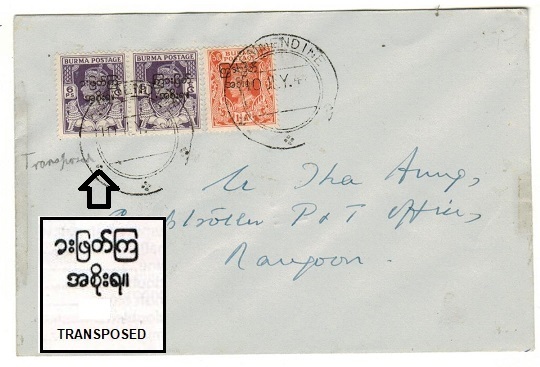 local registered cover bearing 3a6p block of four (SG 76) cancelled by PAZUNDAUNG cds with all four stamps showing the OVERPRINT INVERTED. BK 56a. BURMA - 1948 local cover with 6as showing OVERPRINT INVERTED used at PAZUNDAUNG. 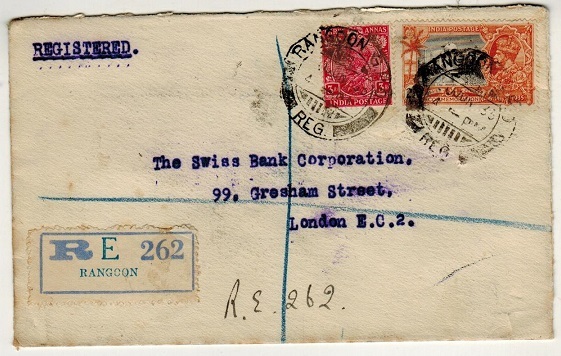 1948 (JLY.7) cover to Rangoon bearing the Interim Govt 6p & 1 1/2a adhesives (SG 69+72) tied by very light PAZUNDAUNG cds with the 6a showing the unlisted variety OVERPRINT INVERTED. Unlisted by SG but noted in the footnote. BK49b. 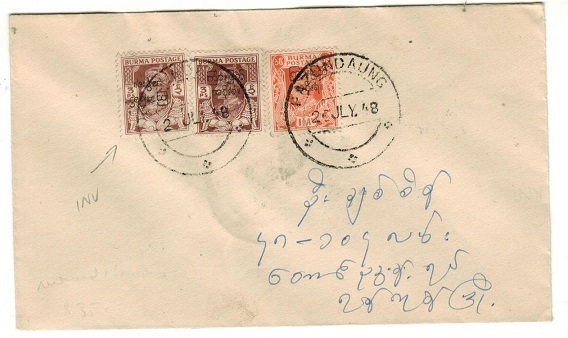 BURMA - 1948 local cover with 2as showing TRANSPOSED OVERPRINT used at KEMMADINE. 1948 (JLY.10.) 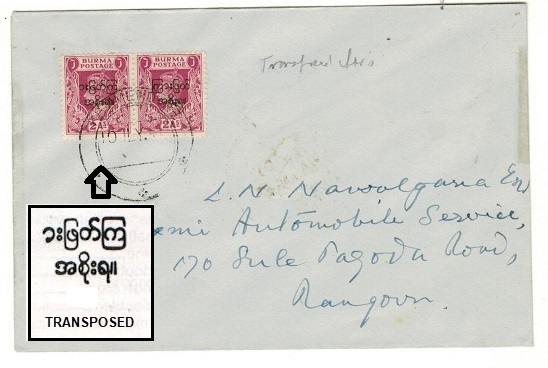 local cover addressed to the 'Controller P&T' in Rangoon bearing 2as adhesive (x2) with one adhesive showing the rare TRANSPOSED OVERPRINT (SG 73b) in pair with normal and tied by KEMMADINE cds. Scarce on cover. These Interim Government stamps had a very short life. BURMA - 1948 local cover with 3ps showing OVERPRINT INVERTED used at PAZUNDAUNG. 1948 (JLY.26.) 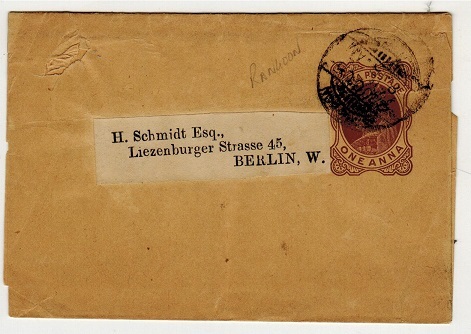 locally addressed cover bearing 3p and 1 1/2as adhesives alongside a further example of the 3p brown showing the major variety OVERPRINT INVERTED cancelled by PAZUNDAUNG cds. A scarce use of these Interim Government stamps on cover which had a short life. BK 48B. 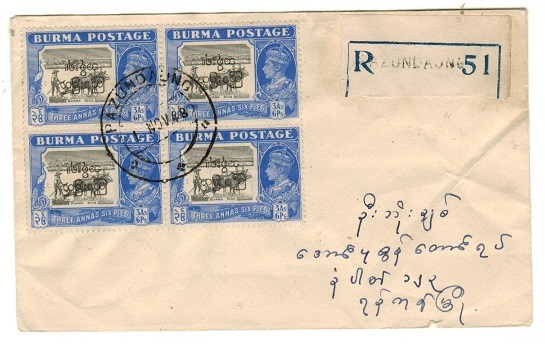 BURMA - 1948 local cover with 6ps adhesive showing TRANSPOSED OVERPRINT used at KEMMADNE. 1948 (JLY.10.) 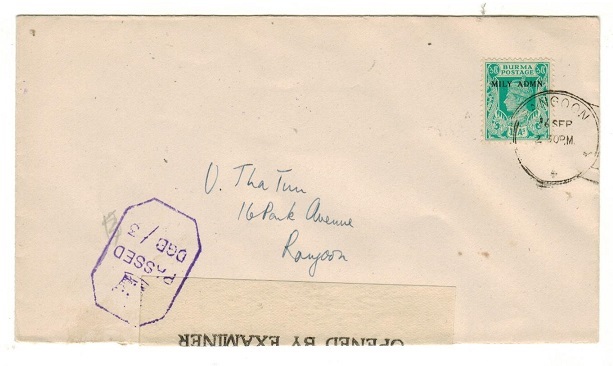 local cover addressed to the 'Controller P&T' in Rangoon bearing 1 1/2as adhesive (SG 72) tied with two 6ps deep violet adhesives with one adhesive showing the rare TRANSPOSED OVERPRINT (SG 69a) in pair with normal and tied by KEMMADINE cds. Scarce on cover. These Interim Government stamps had a very short life. BURMA - 1935 'Indian' 3a and 2 1/2a 'Silver Jubilee' adhesives used on cover at RANGOON. 1935 (JUN.20.) 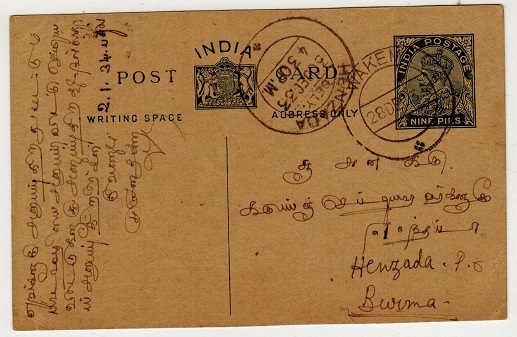 registered cover addressed to UK (opened on two sides) bearing Indiann 3as together with 2 1/2a 'Silver Jubilee' adhesive tied by RANGOON GPO/REG cds. 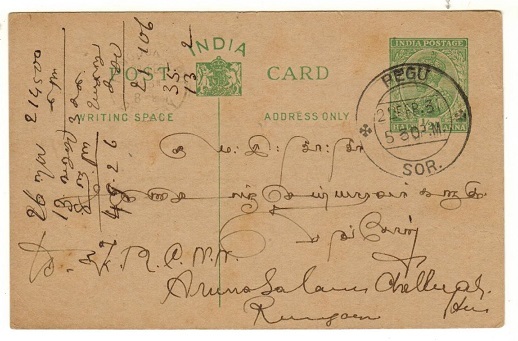 BURMA - 1923 1/2a green postal stationery wrapper of India used at RANGOON. H&G 3. 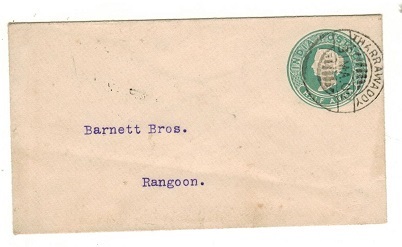 1923 1/2a green on buff postal stationery wrapper of India (H&G 3) addressed to India cancelled by RANGOON GPO/SOR cds. Such uses of this stationery in Burma are rare. 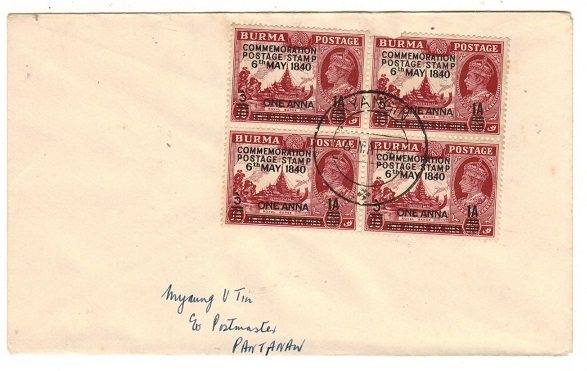 BURMA - 1948 unaddressed cover bearing array of Interim adhesives all with DOUBLE OVERPRINTS. 1948 illustrated 'Independence Republic' unaddressed cover (refolded) bearing 1947 Interim Burmese Government 3ps, 6ps, 9ps, 3a and 3a6p adhesives each with major variety OVERPRINT DOUBLE and additional 1 1/2as adhesive showing the OVERPRINT DOUBLE ONE INVERTED. All tied by special BURMA INDEPENDENCE LIBERATION PO cds's dated 6.JA.48. A scarce array on cover. 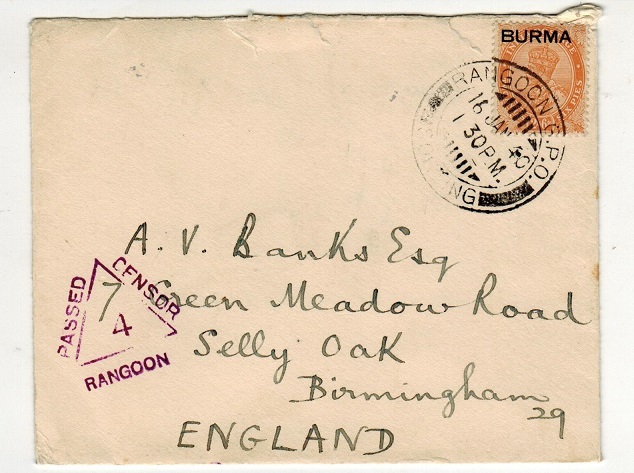 BURMA - 1946 inward 'BMA' cover from Malaya with 'DGB/3' censor strike applied. 1946 inward 'BMA/Malaya' cover (overall toned) with neat KYONPYAW arrival cds applied to reverse side and with scarce octagonal DGB/3 censor h/s applied in violet. Morenweiser type 5B. Complete with original contents. 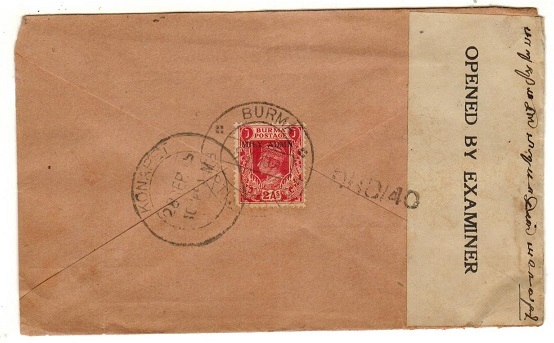 BURMA - 1945 2a rate cover to India with 'DGB/2' censor applied. 1945 (DEC.24.) 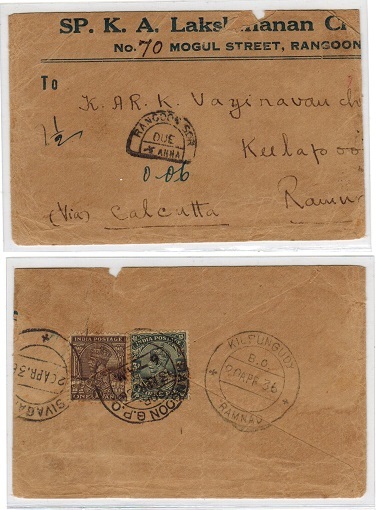 cover addressed to India (over all toned) bearing 2as 'Mily Admn' adhesive on reverse side tied by BUY POST OFFICE/CASH CERTIFICATES cancel with RAYAWARAM cds alongside and struck by octagonal DGB/2 censor handstamp in blue ink. Moreweiser type 5B. Complete with original contents. BURMA - 1960 50c green JUDICIAL adhesive in unused mint condition. 1960 50c green JUDICIAL adhesive in fine unused condition (as issued) with roulette perforations. Barefoot and Hall 3a. A scarce stamp. BURMA - 1948 'Rangoon to Mergui' first flight illustrated cover. 1948 (JAN.22.) 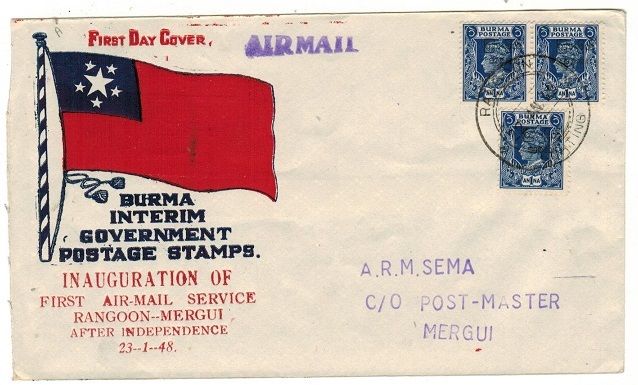 illustrated 'Inauguration Of First Air Mail Service Rangoon-Mergui' first flight cover bearing 1a blue (x3) tied RANGOON/SORTING and with MERGUI arrival b/s. BURMA - 1934 use of Indian 1/2a green PSC (H&G 30) uprated at MANDALAY R.S. 1934 (SEP.30.) 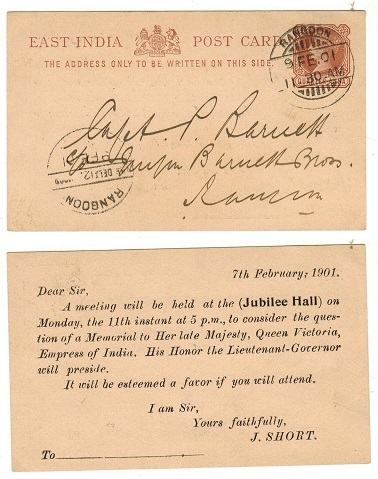 use of Indian 1/2a green on buff postal stationery postcard (H&G 30) addressed locally and bearing additional Indian 3ps adhesive tied MANDALAY R.S./R.M.S. (Proud type D6). A scarcer Railway Station cancel. BURMA - 1925 use of Indian 1/2a green PSC (H&G 30) uprated at MINHLA. 1925 (APR.17.) 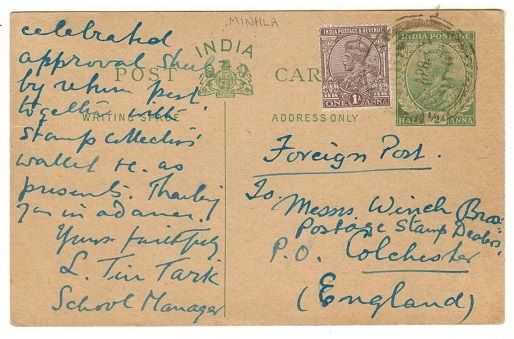 use of Indian 1/2a green on buff postal stationery postcard (H&G 30) addressed to UK and bearing additional Indian 1a adhesive tied by light MINHLA cds. BURMA - 1931 use of Indian 1/2a green PSC (H&G 30) used at PEGU/S.O.R. 1931 (FEB.22.) 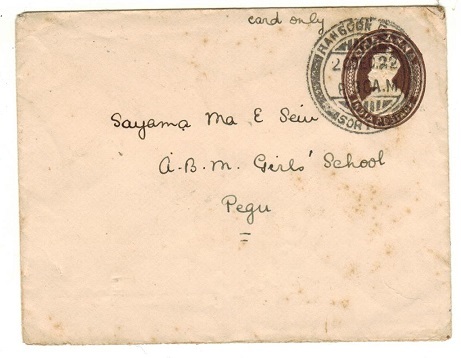 use of Indian 1/2a green on buff postal stationery postcard (H&G 30) addressed locally and cancelled by PEGU/SOR cds. BURMA - 1922 use of Indian 1/2a PSE uprated locally and used at THARRAWADDY. 1922 (JUN.30.) use of Indian 1/2a yellow green postal stationery envelope addressed locally to Moulmein and bearing additional Indian 1/2a adhesive tied THARRAWADDY. Proud type D10. BURMA - 1922 use of Indian 1a brown PSE to Pegu used at RANGOON GPO SORTING. 1922 (DEC.20.) 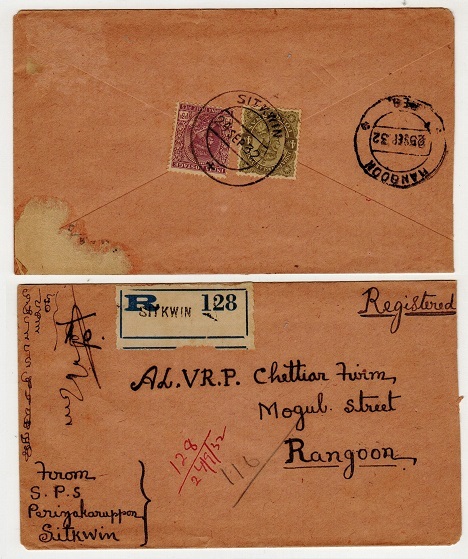 use of Indian 1a brown postal stationery envelope addressed locally to Pegu (some odd tone spots) and cancelled by RANGOON GPO/SORTING cds. BURMA - 1947 6a blue uprated air letter to USA with scarce TAUNGGYI/DUE/AS tax mark. H&G 2. 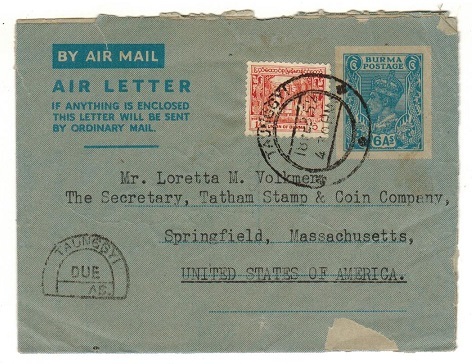 1947 6a blue on grey postal stationery air letter addressed to USA (genuine use) bearing additional 1a adhesive tied TAUNGGYI cds dated 18.FE.52 but struck with 'horse shoe' TAUNGGYI/DUE/AS tax mark. H&G 2. 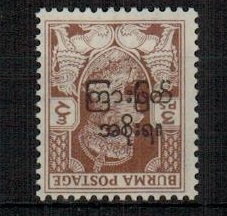 BURMA - 1947 3ps brown U/M with INVERTED OVERPRINT. SG 68. 1947 3ps brown 'Interim Burmese Government' adhesive in fine unmounted mint condition showing the variety OVERPRINT INVERTED. Noted by SG in footnote. SG 68. 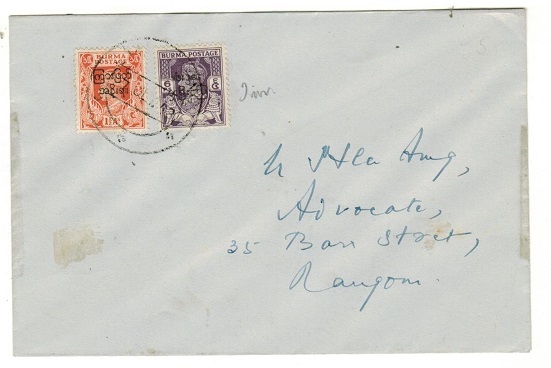 BURMA - 1935 7 1/2a rate (Indian Silver Jubilee) adhesive cover to UK used at RANGOON. 1935 (MAR.18.) 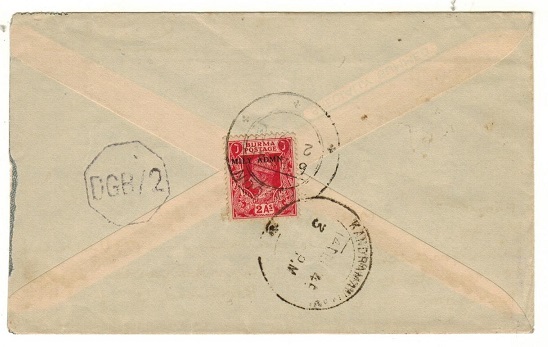 cover addressed to UK (central fold) bearing threee examples of the Indian 2 1/2a 'Silver Jubilee' adhesive (SG 244) tied RANGOON GPO/SORTING. BURMA - 1912 1a rate postcard use to UK cancelled by 'RANGOON R.M.S.-SET 1' railway strike. 1913 (SEP.23.) 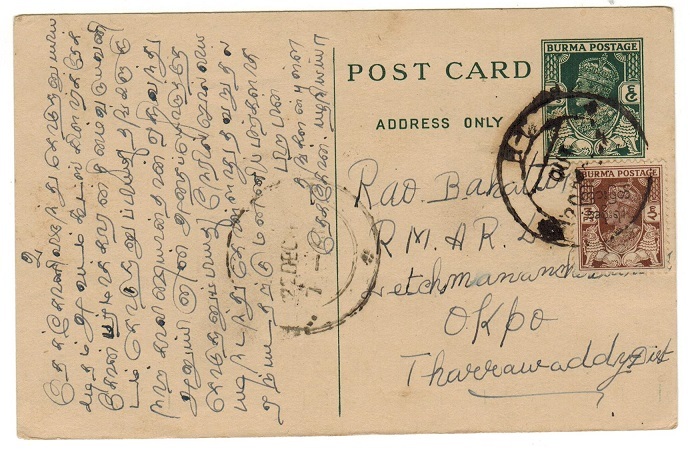 use of picture postcard addressed to UK depicting 'Shwe Dagon Pagoda-Rangoon' bearing Indian 1a adhesive tied by RANGOON R.M.S./SET 1 railway cds. A scarce use. BURMA - 1945 1a rate local censor cover used at RANGOON. 1945 (SEP.16.) 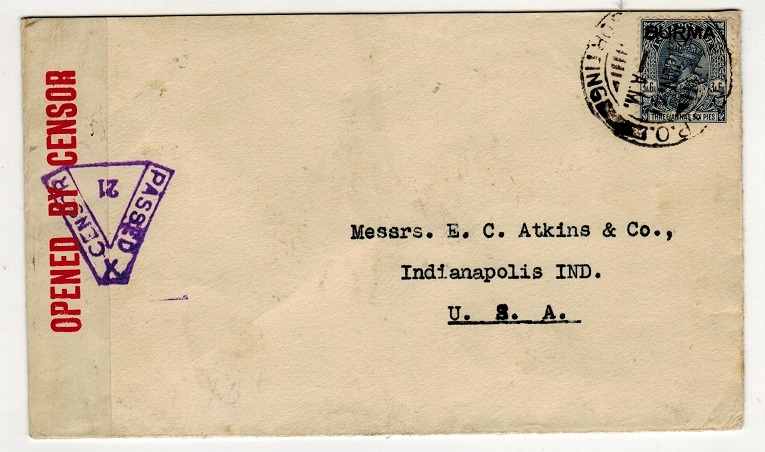 cover addressed locally bearing 1as 'Mily Admn' adhesive tied by RANGOON cds with black on white OPENED BY EXAMINER label at bottom edge tied on the frong by violet octagonal crowned PASSED/ DGB/ 3 h/s. Morenwesier type 4B. Only used at Rangoon between September and December of 1945. BURMA - 1945 3a6p rate local censor cover used at RANGOON. 1945 cover addressed locally to the B.L.A. bearing 1p (x3), 3p and 3a adhesives all overprinted MILY ADMN adhesives tied by RANGOON wavy lined strike with scarce black on white OPENED BY EXAMINER label (Little type 2) tied on reverse side by scarce violet octagonal crowned PASSED/ DGB/3 h/s. (Little type 4b). BURMA - 1945 2a rate censor cover to India used at BURMA/EXPTL. PO. 1945 (SE.8.) 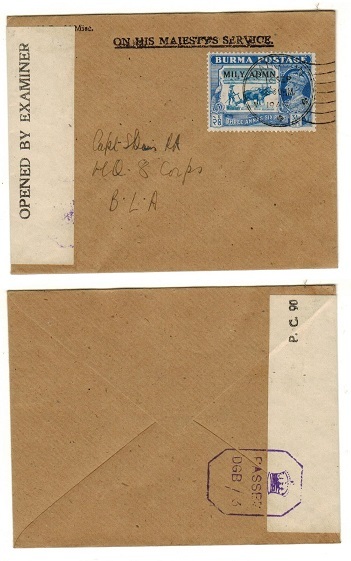 cover addressed to India bearing 2as 'MILY ADMN' adhesive tied to reverse flap by BURMA/EXPTI PO cancel. The cover has a censor label at the right side added and tied on reverse by crowned PASSED strike (used in Burma) but this is partly covered by the addition on an India OPENED BY EXAMINER label added on arrival and tied by s/l DHD/65 strike. BURMA - 1945 2a rate censor cover to India used at BURMA/EXPTL.P.O.No.4. 1945 (AUG.9.) 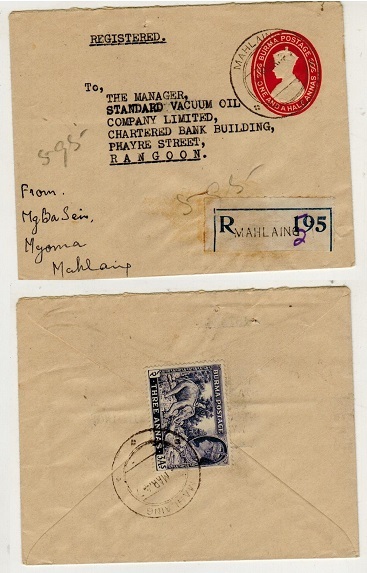 cover addressed to India bearing 2as adhesive overprinted MILY ADMN and cancelled by BURMA/EXPTL.P.O.No.4 cds with black on cream P.C.90/OPENED BY EXAMINER label at left and struck on the reverse by s/l DHD/40 censor h/s in black. BURMA - 1945 2a rate censor cover to India used at RANGOON. 1945 (DE.6.) 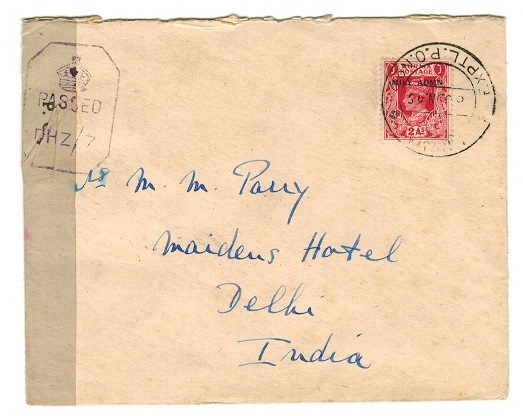 cover addressed to India bearing 2a adhesive on reverse flap overprinted 'MILY ADMN' and tied by RANGOON cds and struck by scarce octagonal DCB/2 censor h/s in black ink (Little type 5B). BURMA - 1941 4a rate censor cover to USA used at INSEIN. 1941 (DEC.10.) 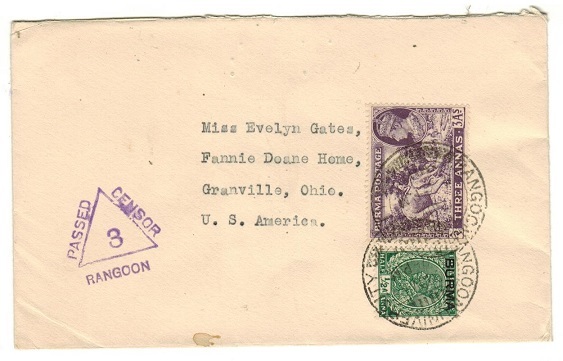 cover addressed to USA bearing 1a brown strip of four tied INSEIN with red on cream OPENED BY CENSOR label at left tied by violet X/PASSED/CENSOR/52 h/s. Moreweiser type type 2X. BURMA - 1941 3a6p rate censor cover to USA used at TONGYI. 1941 (SEP.21.) 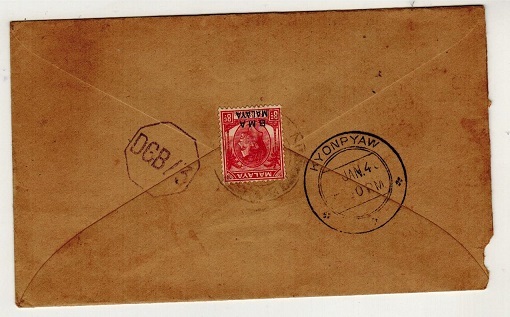 cover addressed to USA bearing 3a6p adhesive tied by TONGYI cds with red on white OPENED BY CENSOR label at left tied by violet PASSED/X/CENSOR/49 h/s. (Moreweiser type 2X). 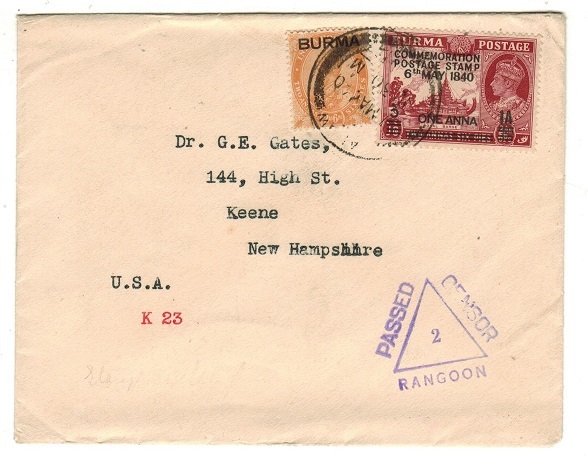 BURMA - 1939 3 1/2a rate censor cover to USA used at RANGOON UNIVERSITY. 1939 (NOV.9.) 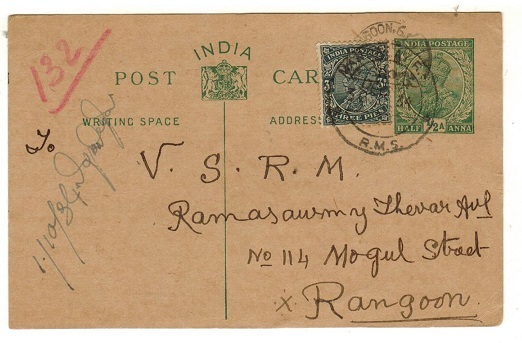 cover addressed to USA bearing 'GV' 1/2a green adhesive of India overprinted BURMA with KGVI 3as violet tied by RANGOON UNIVERSITY cds with violet triangular PASSED/CENSOR/RANGOON/3 h/s at left. Moreweiser type 1A1. 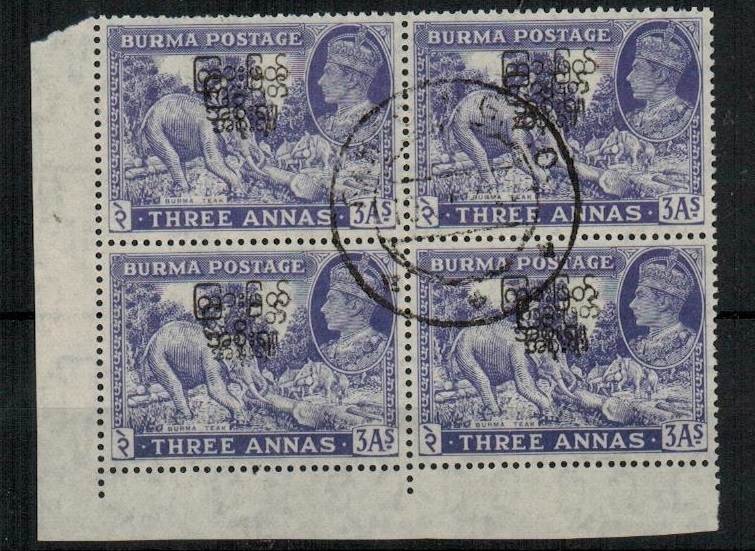 BURMA - 1947 3a blue-violet 'Interim Govt' used block of four with DOUBLE OVERPRINT variety. 1947 3a blue-violet 'Interim Goverment' overprint adhesive in a fine used corner marginal block of four (few short perfs at top) cancelled by RANGOON GPO cds and showing the scarce OVERPRINT DOUBLED variety on each stamp. Unlisted by SG. SG 75. 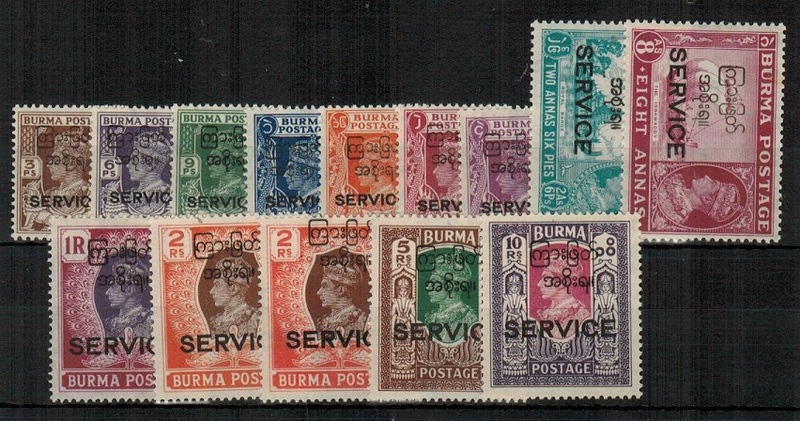 BURMA - 1947 'Interim Govt' SERVICE set U/M. SG 041-53. 1947 'Interim Burmese Government' series of 13 values in fine unmounted mint condition overprinted SERVICE in black with interim government overprint applied. Additional 2r in striking different shade. SG 041-53. BURMA - 1946 3a6p rate OHMS 'PASSED/DGB 3' censor military cover. 1946 O.H.M.S. military local use cover bearing 3a6p blye MILY ADMIN adhesive (SG 44) tied RANGOON and with OPENED BY EXAMINER censor label at left tied on the reverse side by violet crowned PASSED/ DGB/3 strike. BURMA - 1946 1 1/2a orange-red PSE used locally at THANBYUZAYAT MEMORIAL CEREMONY. H&G 3a. 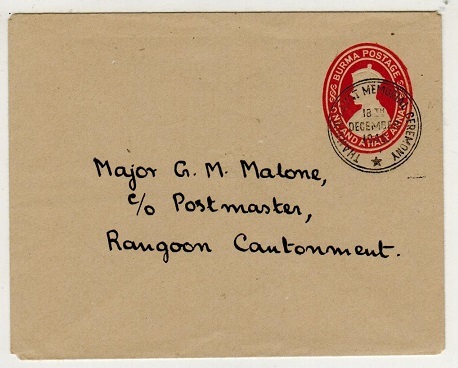 1946 1 1/2a orange-red on smooth amber wove paper postal stationery envelope addressed locally to Rangoon Cantonment cancelled by very fine THANBYUZAYAT MEMORIAL CEREMONY cancel (Proud type HS1) dated 18th December 1946. Only used on this day. H&G 3a. BURMA - 1946 1 1/2a orange-red uprated PSE used locally at MAYMYO. H&G 3. 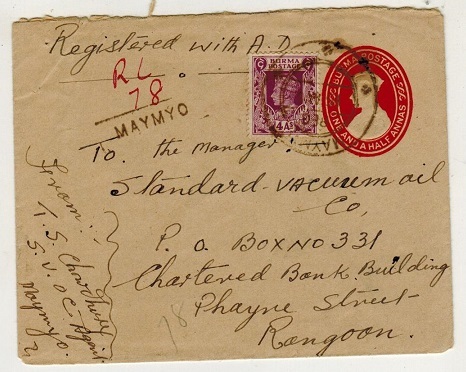 1946 1 1/2a orange red on rough buff woved paper postal stationery envelope registered to Rangoon uprated with additional 4a adhesive and cancelled MAYMYO (Proud type R7) dated 18.AUG.47 and struck by black straight lined MAYMYO h/s for registration. H&G 3. BURMA - 1946 1 1/2a orange-red uprated PSE used locally at MAHLAING. H&G 3. 1946 1 1/2a orange red on rough buff woved paper postal stationery envelope registered to Rangoon cancelled MAHLAING (Proud type D4) dated 4.MAR.47 with blue on white R 195 registered 'blank' type label below cancelled by straight lined MAHLAING h/s in black and uprated on reverse by additional 3a adhesive. H&G 3. BURMA - 1946 1 1/2a orange-red PSE uprated locally at THATON. H&G 3. 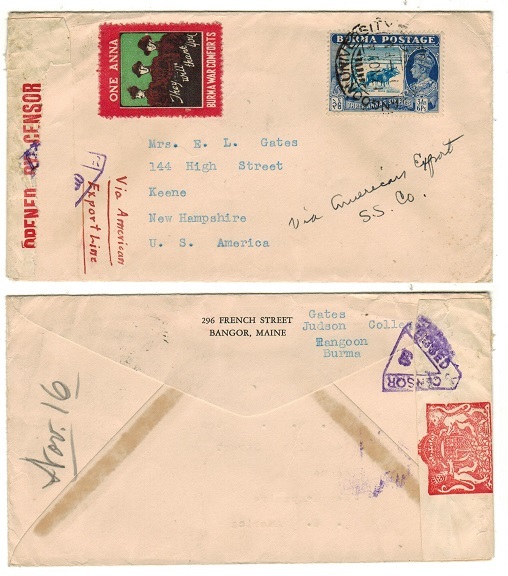 1946 1 1/2a orange red on rough buff woved paper postal stationery envelope registered to Rangoon bearing additional 1/2a adhesive on front and 2a pair on reverse tied by THATON dated 28.MAR.48 with black boxed 198 (lottery type label) used for registration handstamped THATON in black. The cancel having three crosses in bottom part of cancel which is unlisted by Proud. H&G 3. BURMA - 1946 1/2a orange-red uprated PSE used locally at SHWEBO. H&G 3. 1946 1 1/2a orange red on rough buff woved paper postal stationery envelope registered to Rangoon cancelled SHWEBO (Proud type R9) dated 18.JY.47 with blue on white R 97 registered 'blank' type label below cancelled by straight lined SHWEBO h/s in black and uprated on reverse by 1 1/2a and 6ps pairs. H&G 3. BURMA - 1940 'Commemoration' FDC used locally with block of 4 (SG 34) cancelled RYANGIN. 1940 (MAY.6.) first day cover addressed locally bearing a fine block of four of the 1a on 2a6p 'Commemoration Postage Stamp' adhesive (SG 34) cancelled by central RYANGIN cds. BURMA - 1943 1c orange unused pair with MISPLACED STOP AFTER 1. SG J73. 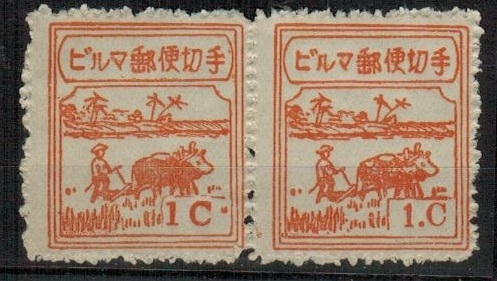 1943 1c orange 'Burma Government' issue mint pair without gum as issued with the left stamp showing MALFORMED VALUE TABLET BOX and having the variety MISPLACED STOP AFTER 1. An interesting item. SG J73. 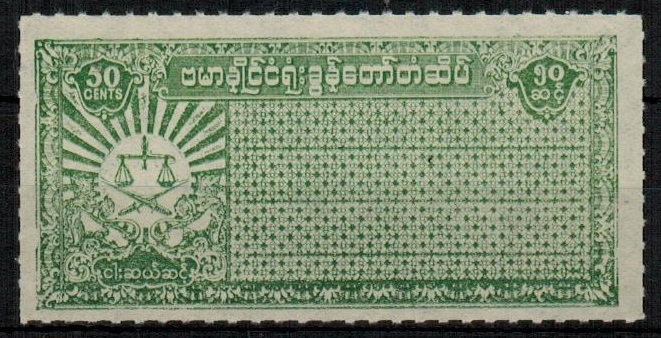 BURMA - 1947 9p green fine mint with INVERTED OVERPRINT. SG 70a. 1947 9p green 'Interim Government' adhesive in very fine mint condition showing the major variety OVERPRINT INVERTED. SG 70a. BURMA - 1924 1/2a green Indian PSE uprated to Rangoon and used at BASSEIN BURMA. 1924 (DE.28.) 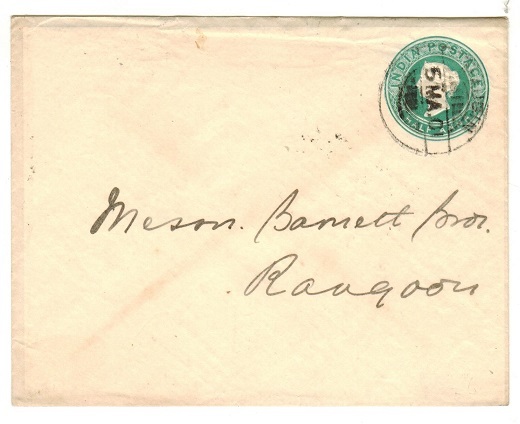 use of Indian 1/2a green on cream 'KGV' postal stationery envelope addressed to Rangoon bearing additional Indian 1/2a green adhesive tied by BASSEIN/BURMA cds. 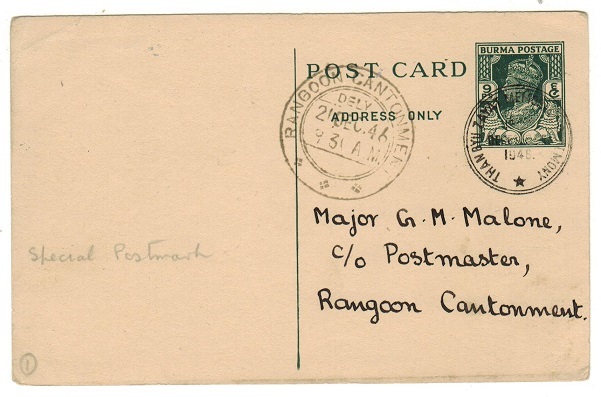 BURMA - 1934 use of 8a Indian PSE to UK used at TAVOY with TOO LATE FOR AIR MAIL h/s applied. 1934 (SEP.15.) 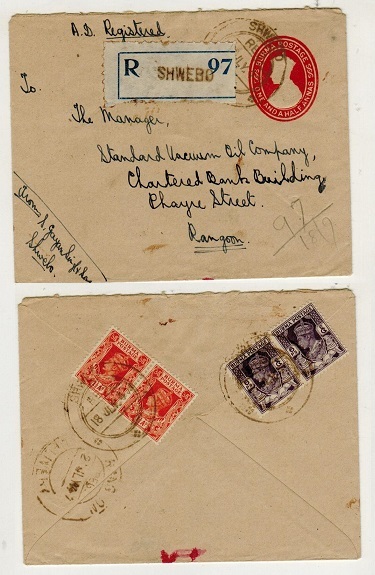 use on Indian 8a red-violet postal stationery envelope (H&G 1) tied by scarcer TAVOY cds with scarce black boxed TOO LATE FOR AIRMAIL/RANGOON h/s at lower left. 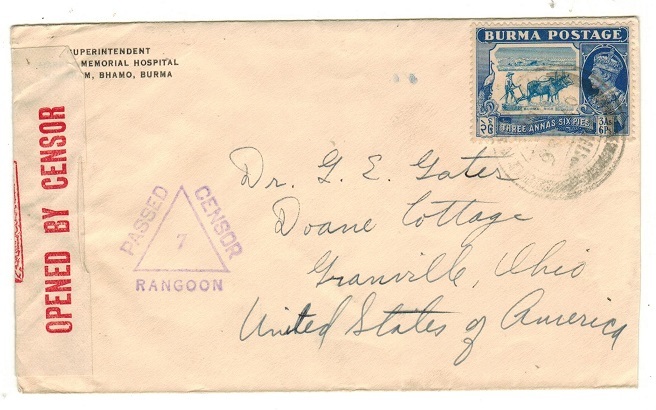 BURMA - 1941 censor cover to USA used at RANGOON UNIVERSITY with 1a BURMA WAR COMFORTS label. 1941 (NOV.17.) 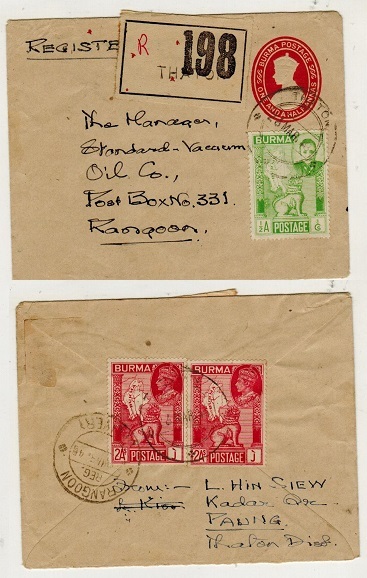 cover addressed to USA bearing 3a6p adhesive tied by RANGOON UNIVESITY cds with red, green and brown 1a BURMA WAR COMFORTS patriotic label at left. Large part red on cream crested OPENED BY CENSOR label at left tied on the front and reverse sides by PASSED/X/CENSOR/60 h/s's in violet. Moreweiser type 2X. 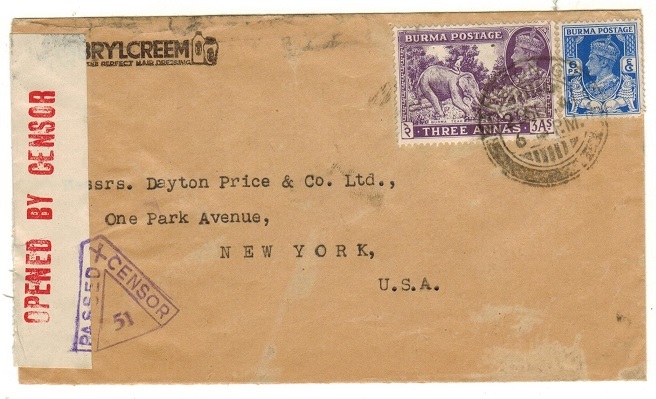 BURMA - 1941 censor cover to USA used at RANGOON SORTING. 1941 (MAR.10.) 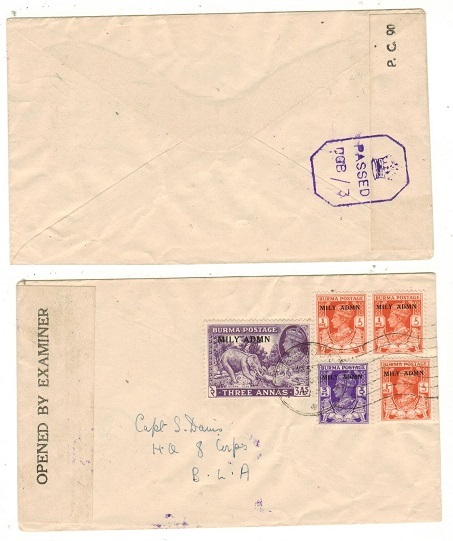 cover addressed to USA bearing 6ps and 1a (x3) tied by RANGOON/SORTING cds with red on cream creasted OPENED BY CENSOR label at left tied on the front and reverse by PASSED/X/CENSOR/7 h/s's. Morenweiser type 2X. 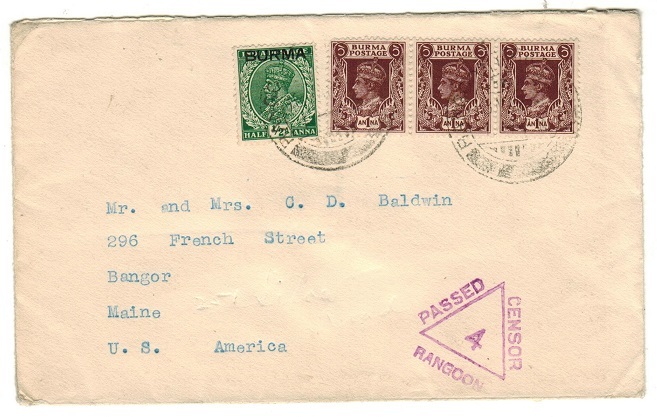 BURMA - 1940 'PASSED BY CENSOR 2' cover to USA used at KALAW. 1940 (MAR.7.) cover addressed tp USA bearing Indian 2a6p adhesive overprinted BURMA with 1a on 2a6p 'Commemoration/Postage Stamp' surcharge stamp tied by KALAW cds. This commenoration stamp is very tricky to find gebuinely used on non FDC covers. Struck on the front by violet triangular PASSED/CENSOR/2/RANGOON h/s. 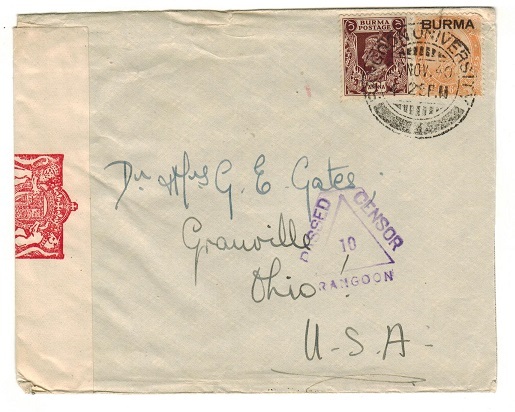 BURMA - 1940 'PASSED BY CENSOR 10' cover to USA used at RANGOON UNIVERSITY. 1940 (NOV.27.) 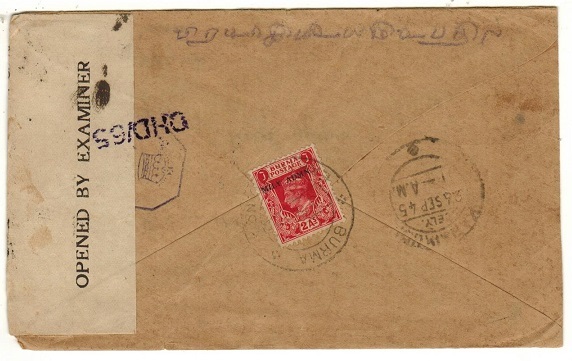 cover addressed to USA bearing 2a6p adhesive of India overprinted BURMA together with 'KGVI' 1a brown tied by RANGOON UNIVERSITY cds with red on cream crested OPENED BY CENSOR label at left and struck on the front by violet triangular PASSED/CENSOR/10/RANGOON h/s. No. 10 being unrecorded according to Morenweiser. 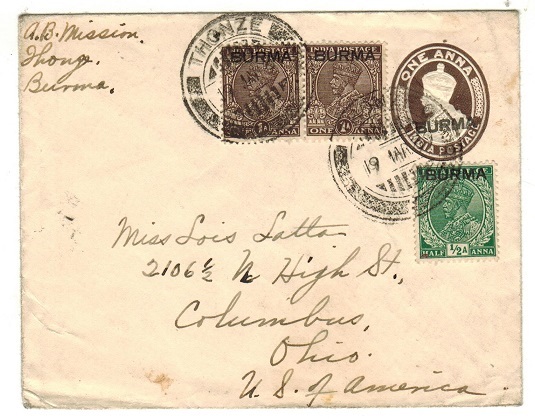 BURMA - 1940 'PASSED BY CENSOR 7' cover to USA. 1940 (SEP.9.) 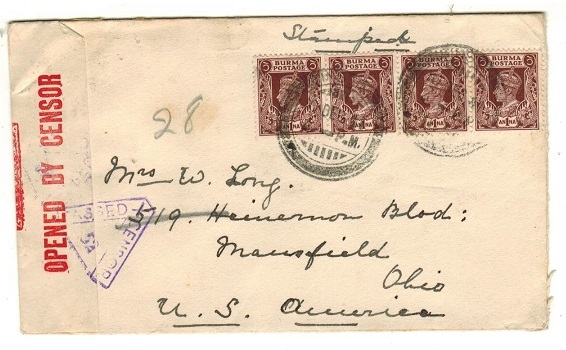 cover addressed to USA bearing 3a6p adhesive with red on cream crested OPENED BY CENSOR label at left and struck on the front by violet triangular PASSED/CENSOR/7/RANGOON h/s. BURMA - 1938 1a brown PSE uprated to USA at THONZE. H&G 1a. 1938 1a brown on cream 'KGV' postal stationery envelope of India overprinted BURMA addressed to USA and bearing additional Indian 1/2a green overprinted BURMA alongside 3ps violet pair tied by THONZE cds dated 2.APR.39. Proud type KD6. H&G 1a. 1938 1a brown on cream 'KGV' postal stationery envelope of India overprinted BURMA addressed to USA and bearing additional Indian 1/2a green and 1a brown pair overprinted BURMA by THONZE cds dated 19.MAR.39. Proud type KD6. H&G 1a. 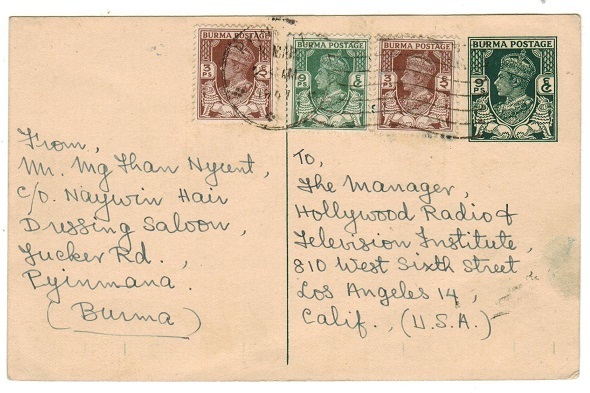 BURMA - 1940 censored cover to USA used at YENANGYAUNG. 1940 (NOV.2.) 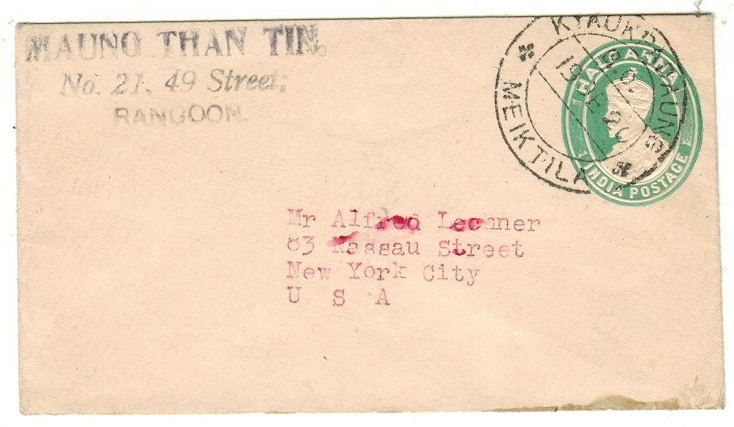 cover addressed to USA bearing 1a (x3) and 6ps adhesives on reverse side tied by YENANGYAUNG cds with red on cream OPENED BY CENSOR label at left and struck by violet triangular PASSED/CENSOR/10/RANGOON h/s No.10 censor being unrecorded according to Morenweiser. BURMA - 1941 'PASSED/X/CENSOR/51' censor cover to USA. 1941 (SE.20.) 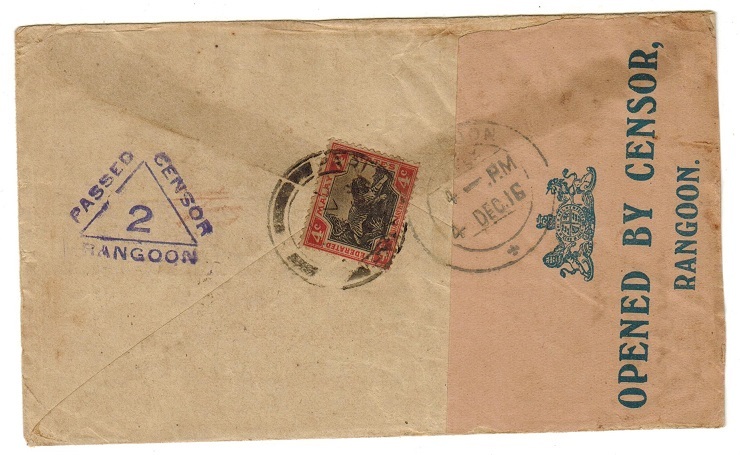 cover addressed to USA bearing 6pts and 3as adhesives tied RANGOON GPO with red on cream OPENED BY CENSOR crested label at left (Moreweiser type 1A2) tied by violet triangular PASSED/CENSOR/51 strike. BURMA - 1940 'PASSED CENSOR/4/RANGOON' censor cover to USA. 1940 (APR.13.) cover addressed to USA bearing 'GV' 1/2d green India adhesive overprinted BURMA with KGVI 1a brown strip of three tied RANGOON (University) with magenta triangular PASSED/CENSOR/4/RANGOON h/s below. Moreweiser type 1A1. Unrecorded in magenta. BURMA - 1913 1/2a green PSE of India to USA used at KYAUKPADAUNG/MEIKTILA-BO. H&G 9. 1913 1/2a yellow green on white postal stationery envelope of India (size c) addressed to USA and cancelled by KYAUKPADAUNG/MEIKTILA - BO cds (Proud type D3) dated 19.DE.20. H&G 9. BURMA - 1899 1a on 2a6p orange PSE of India used locally from HENZADA. H&G 7. 1899 1a on 2a6p Orange on white postal stationery envelope of India addressed locally and cancelled by scarce HENZADA cds dated MA.19.01. Rangoon arrival b/s. H&G 7. BURMA - 1883 1/2a green PSE of India used locally from MAUBIN. H&G 4a. 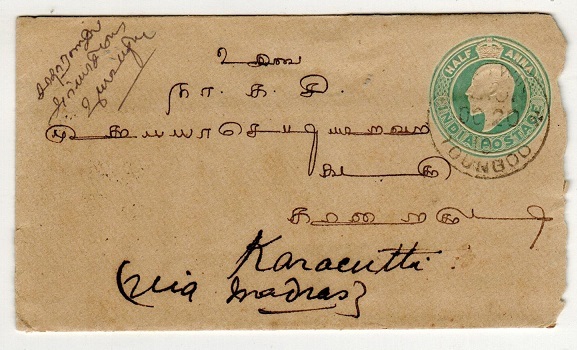 1883 1/2a green on white postal stationery envelope (type f) of India addressed locally and cancelled by MAUBIN cds dated 5.MA.01. Rangoon arrival b/s. H&G 4a. 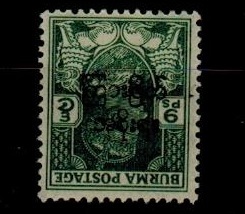 BURMA - 1883 1/2a green PSE of India used locally from THARRAWADDY. H&G 4. 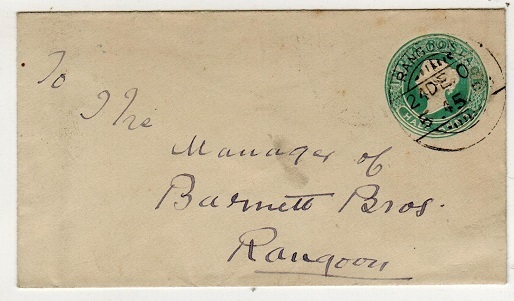 1883 1/2a Green on white postal stationery envelope (type c) of India addressed locally and cancelled by scarce THARRAWADDY cds dated 31.MA.02 with Rangoon arrival b/s. H&G 4. BURMA - 1857 1a brown PSE of India used locally at RANGOON. H&G 2e. 1857 1a Brown on white (no seal) postal stationery envelope (size F) of India addressed locally and cancelled by RANGOON cds dated 24.DE.00. H&G 2e. BURMA - 1899 1/4a red-brown PSC of India used locally at RANGOON. H&G 12. 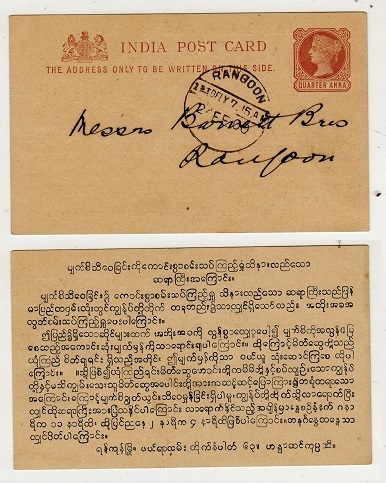 1899 1/4a Red-brown on buff postal stationery postcard addressed locally cancelled by RANGOON cds dated 2.FE.00. H&G 12. BURMA - 1895 1a brown postal stationery wrapper of India to Germany used at RANGOON. H&G 2. 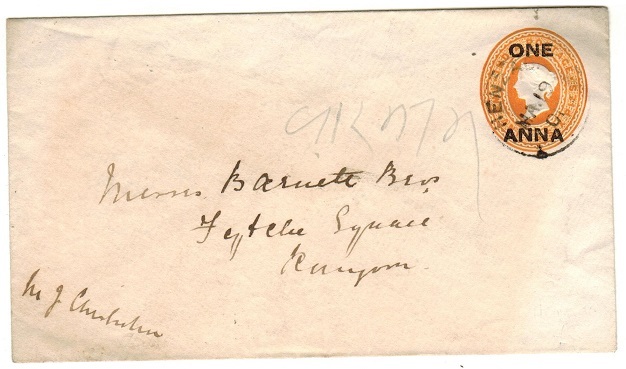 1895 1a brown on buff postal stationery wrapper of India (H&G 2) addressed to Germany and cancelled by a somewhat smudged RANGOON cds dated 23.OC.05. BURMA - 1894 (circa) 1/4a ultramarine 'SERVICE' PSC used at locally at RANGOON. 1894 (circa) 1/4a ultramarine 'EAST INDIA SERVICE POST CARD' addressed locally and pre-printed for use by 'Revenue' on reverse cancelled by RANGOON cds dated 30.NO.97 with Mandalay arrival cds. BURMA - 1890 1/4a brown Indian PSC used locally at RANGOON. H&G 7. 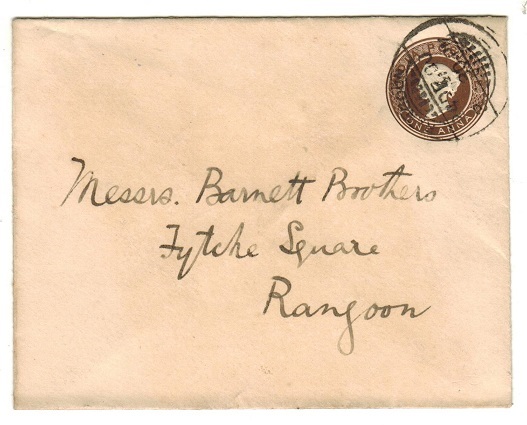 1890 1/4a brown on buff postal stationery postcard addressed locally and cancelled by RANGOON cds dated 9.FE.01. H&G 7. BURMA - 1883 1/2a green Indian PSE used locally from RANGOON. H&G 4. 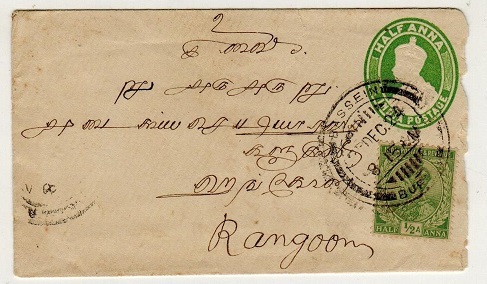 1883 1/2a green on white postal stationery envelope (type c) addressed locally and cancelled by RANGOON cds dated 24.DE.01. backstamped on arrival at Rangoon with Christmas Day cds. H&G 4. BURMA - 1932 9p green PSC of India used at MINHLA/THARRAWADDY. H&G 36. 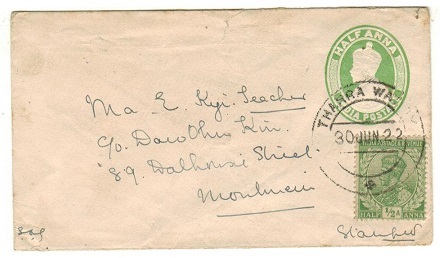 1932 9 pies dark green on buff Indian postal stationery postcard (H&G 36) addressed to Thayemtyo cancelled by MINHLA/THARRAWADDY cds dated 29.SEP.32. Indian stationery used in Burma. BURMA - 1932 9p green PSC of India used at WAKEMA. H&G 36. 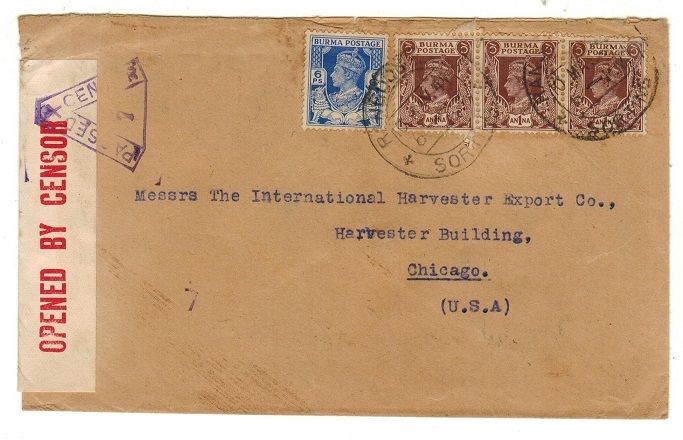 1932 9 pies dark green on buff Indian postal stationery postcard (H&G 36) addressed to Hewzada cancelled by WAKEMA cds dated 28.DEC.33. Indian stationery used in Burma. BURMA - 1932 9p green PSC of India used at SINBAUNGWE. H&G 36. 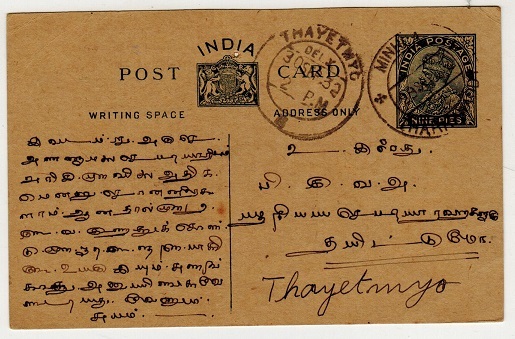 1932 9 pies dark green on buff Indian postal stationery postcard (H&G 36) addressed to Thayemtyo cancelled by SINBAUNGWE cds dated 20.DE.34. (Some edge creasing). Indian stationery used in Burma. 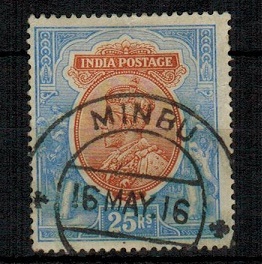 BURMA - 1913 25r 'India' adhesive used at MINBU. SG 191. 1913 25r orange and blue adhesive of India cancelled by very fine MINBU d/r cds dated 16.MAY.16. A scarce strike on this top value. SG 191. BURMA - 1913 25r 'India' adhesive used at MOGOK. SG 191. 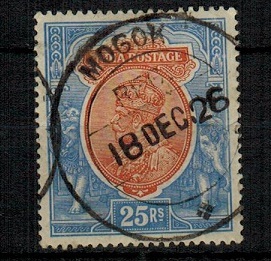 1913 25r orange and blue adhesive of India cancelled by very fine MOGOK d/r cds dated 18.DEC.26. A scarce strike on this top value. SG 191. BURMA - 1913 15r 'India' adhesive used at KYAUKMEDAUNG. SG 190. 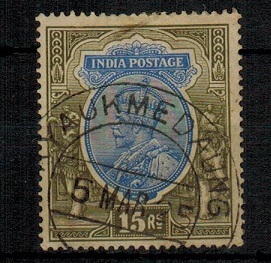 1913 15r blue and olive adhesive of India cancelled by very fine KYAUKMEDAUNG cds dated 5.MAR.25. A scarce Tavoy district cancel. SG 190. 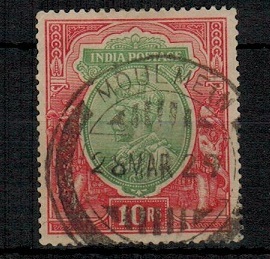 BURMA - 1913 10r 'India' adhesive used at MOULMEIN. SG 189. 1913 10r green and scarlet adhesive of India cancelled by very fine MOULMEIN d/r cds dated 28.MAR.29. SG 189. 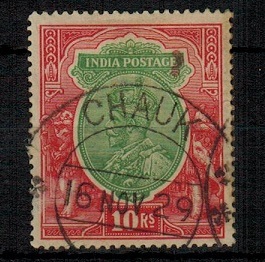 BURMA - 1913 10r 'India' adhesive used at CHAUK. SG 189. 1913 10r green and scarlet adhesive of India cancelled by very fine CHAUK d/r cds dated 16.NOV.29. SG 189. 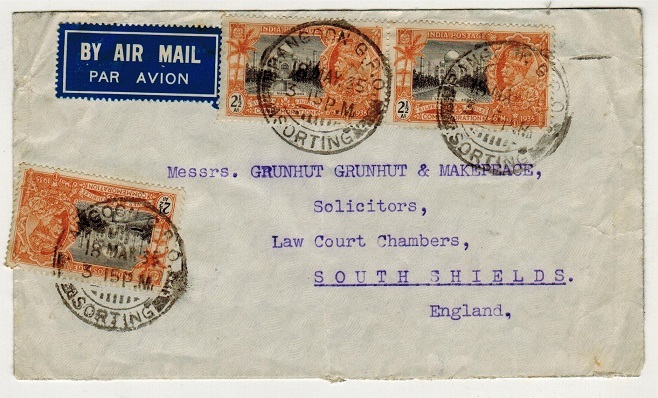 BURMA - 1934 commercial cover to Uk with scarce TOO LATE FOR AIRMAIL/RANGOON h/s applied. 1934 (NOV.19.) 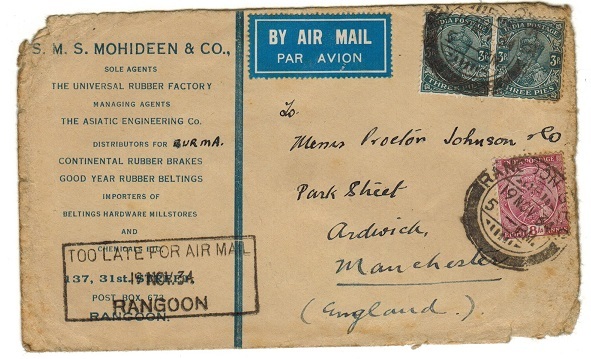 commercial cover addressed to UK (aged edges) bearing Indian 3ps (x2) and 8a adhesives tied by RANGOON cds and struck at lower left by scarce TOO LATE FOR AIR MAIL/ RANGOON handstamp. 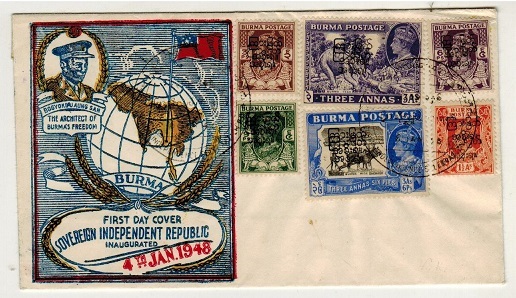 BURMA - 1933 first flight cover to UK. 1933 (OC.2.) 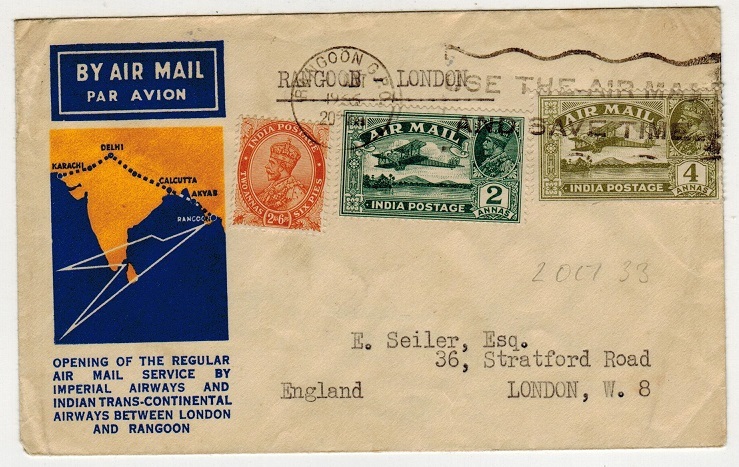 illustrated 'Imperial Airways and Indian Transcontinental Airways' first flight cover addressed to UK bearing Indian 2a6p and 2a and 4a 'air' adhesives tied by RANGOON/USE THE AIR MAIL slogan strike. Special violet commemoration cachet on reverse side. BURMA - 1946 9ps dark green PSC uprated to USA from PYINMANA. H&G 8. 1946 9ps dark green on buff postal stationery postcard addressed to USA bearing additional 3ps (x2) and 9ps adhesives tied by light PYINMANA wavy lined cancel. (Proud M1). H&G 8. BURMA - 1946 9ps PSC cancelled by special commemoration THANBYUZAYAT cancel. H&G 8. 1946 9ps dark green on buff postal stationery postcard addressed locally (no message) and cancelled by THANBYUZAYAT COMMEMORATION STRIKE DATED 18th December 1948 Thanbyuzayat was the terminus on the notorious Burma-Siam Railway and this strike (only used on this day) was used to commemorate the workers who died in its construction. RANGOON CANTONMENT arrival cds at left. H&G 8. BURMA - 1940 2a6p rate censor cover to UK. 1940 (JAN.16.) 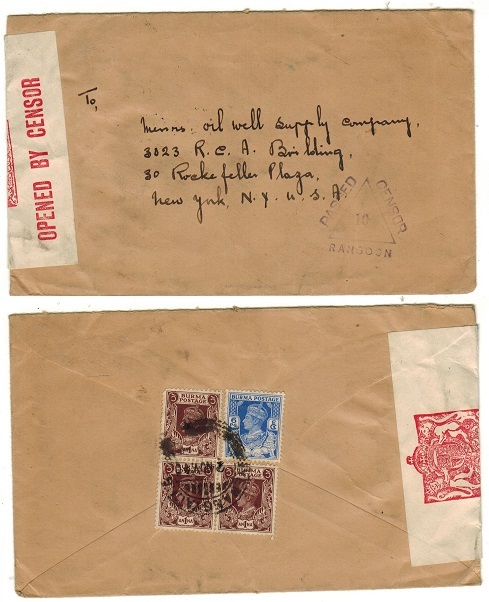 cover addressed to UK bearing 2a6p adhesive tied by RANGOON GPO cds and struck on the front by magenta PASSED/CENSOR/RANGOON/5 h/s (Moreweiser type 1A1). BURMA - 1941 'PASSED X CENSOR/21' 3a6p rate cover to USA used at RANGOON. 1941 (JUN.21.) 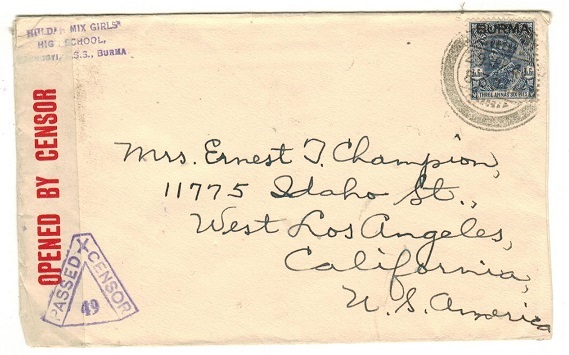 cover addressed to USA bearing GV 3a6p adhesive tied RANGOON GPO/SORTING and with red on cream OPENED BY CENSOR label at left tied on the front and reverse sides by violet triangular PASSED/X/CENSOR/21 h/s. Morenweiser type 2X. 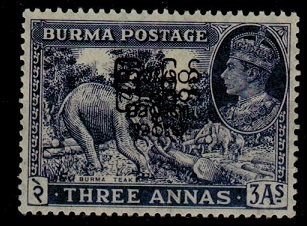 BURMA - 1932 5a3p rate registered local cover used at SITKWIN. 1932 (SEP.24.) registered cover addressed locally bearing Indian 1a3p and 4a adhesives tied to the reverse flap by SITKWIN cds with RANGOON arrival at left. BURMA - 1910 use of 1/2a green Indian PSE used at TOUNGOO. 1910 (OC.20.) 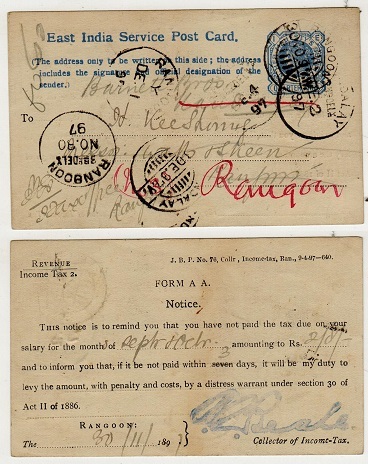 use of Indian 1/2a green on cream postal stationery envelope addressed to Calcutta and cancelled by TOUNGOO cds complete with the original letter. BURMA - 1936 3a rate cover to UK used at YENANGYAUMG. 1936 (JAN.12.) 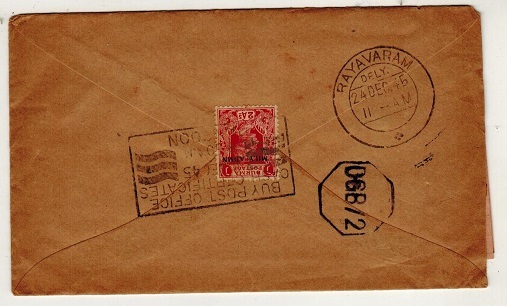 cover addressed to UK bearing Indian 1a brown strip of three tied by YENANGYAUNG cds (Proud type KD6). 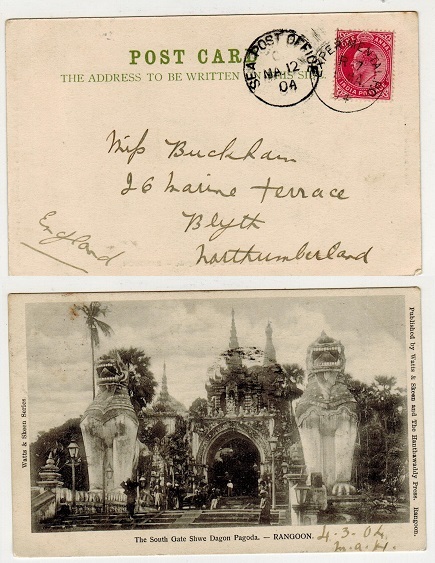 BURMA - 1904 'EXPERIMENTAL/R-7' use of postcard to UK. 1904 (MA.5.) 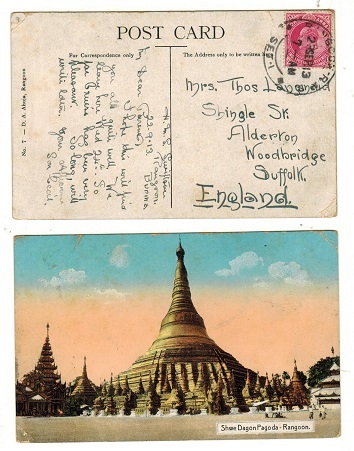 use of picture postcard addressed to UK depicting 'The South Gate Shwe Dagon Pagoda-Rangoon' bearing India 1a adhesive tied by s/r EXPERIMENTAL/R-7 cds and with SEA POST OFFICE transit alongside. BURMA - 1892 2a6p orange PSE of India used at THAYTHYO. H&G 6. 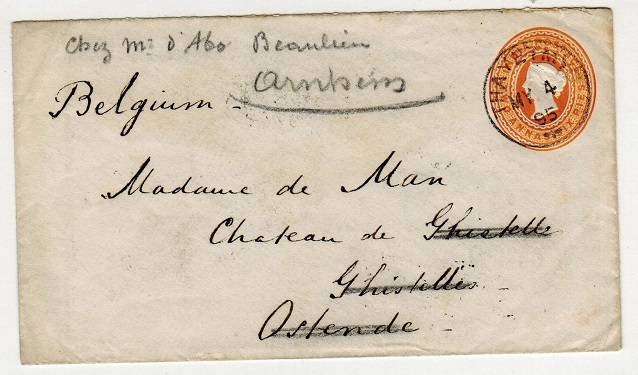 1892 2a6p orange on cream postal stationery envelope (size G) of India addressed to Belgium and cancelled by s/r THAYTMYO cds dated MY.4.95. RANGOON transit b/s and SEA POST OFFICE strike. H&G 6. BURMA - 1938 9p 'KGV' PSC unused. H&G 1. 1938 9 pies 'KGV' dark green on buff postal stationery postcard of India ovpt'd BURMA in fine unused condition. H&G 1. BURMA - 1946 9ps dark green PSC uprated locally. H&G 8. 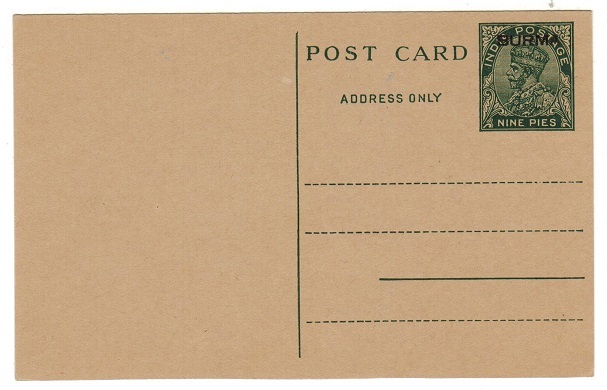 1946 9ps dark green on buff postal stationery postcard addressed locally and uprated with additional overprinted 3ps brown adhesive. H&G 8. BURMA - 1952 returned inward first flight from Norway. 1952 (27.4.) 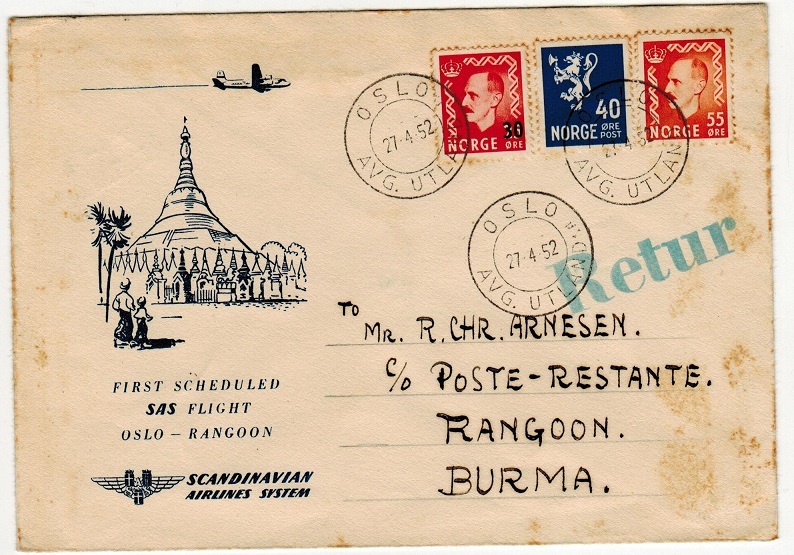 inward 'First Scheduled SAS flight/Oslo-Rangoo' first flight cover from Norway with part RANGOON arrival b/s but undelivered and struck on front by greenish-blue RETUR handstamp. BURMA - 1914 use of Indian 2a+1/2a RPSE (size F) used at BASSEIN. 1914 (MAR.2.) 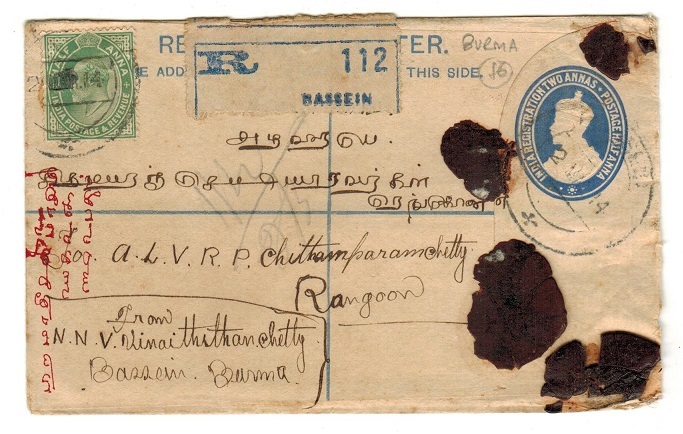 use of 2a+1/2a blue on cream registered postal stationery envelope of India (size F) addressed locally to Rangoon and bearing additional 1/2a adhesive tied BASSEIN. BURMA - 1936 underpaid cover to India with RANGOON SOR/DUE/1/2ANNA tax h/s applied. 1936 (APR.13.) 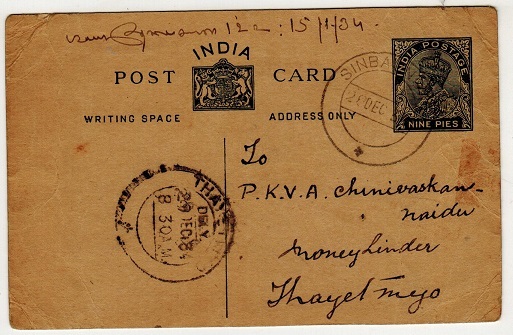 commercial cover addressed to India (slightly reduced at right from opening) bearing Indian 3p and 1a adhesives on reverse flap cancelled by RANGOON GPO cds and being underpaid having scarce 'horse shoe' type RANGOON SDR/DUE/ 1/2 ANNA h/s applied to front. BURMA - 1947 3a blue violet mint with DOUBLE OVERPRINT. SG 75. 1947 3a blue-violet 'Inter Burmese Government' adhesive in fine mint showing the major variety OVERPRINT DOUBLED. SG 75. BURMA - 1945 censored EXPTL P.O.No.2 cover to India. 1945 (JUN.6.) 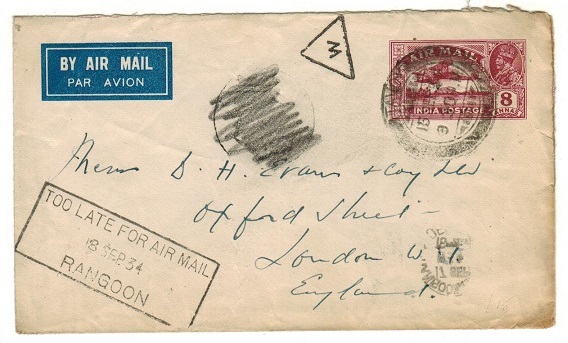 cover addressed to India bearing 2a adhesive overprinted 'Mily Admin' in black and cancelled by EXPTL P.O.No.2 cds with black on greyish OPENED BY EXAMINER censor label at left tied on the front by violet octagonal crowned PASSED/ DH Z/7 censor mark applied on arrival at Calcutta. The 'DHZ' strike is rare. BURMA - 1916 censor cover to India with scarce blue OPENED BY CENSOR/RANGOON label. 1916 (NO.27.) inward cover from Malaya bearing 4c 'tiger' adhesive on reverse flap tied by PARIT BUNTAR cds with a additional strike on the front. Violet triangular PASSED/CENSOR/ RANGOON/2 strike on reverse and with scarce blue on pinkish crested OPENED BY CENSOR/ RANGOON censor label at right tied by light RANGOON arrival cds. 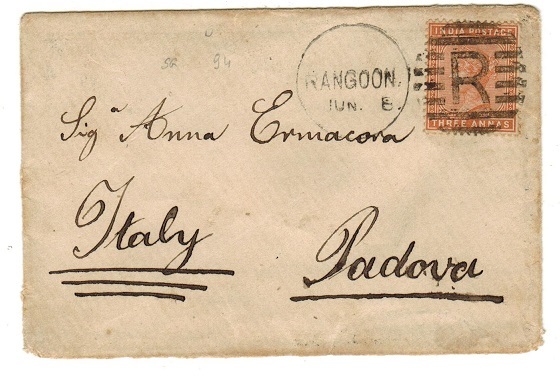 BURMA - 1880 3a rate cover to Italy (scarce) used at RANGOON. 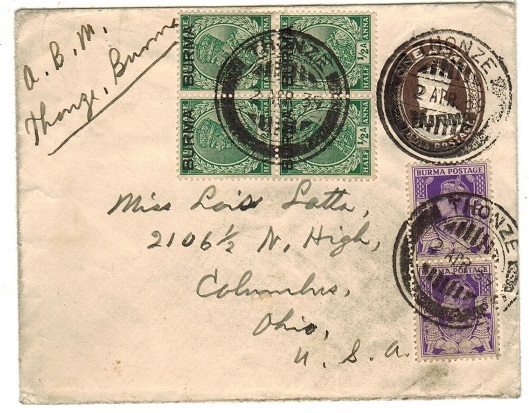 1880 (circa) cover addressed to Italy (scarce) bearing Indian 3a adhesive tied by neat 'R' in bars duplex with RANGOON cds alongside dated JUN.8. (Proud type KD15). BURMA - 1913 6/16ths COURT FEE adhesive unmounted mint. 1913 6/16 Rs (six annas) purple on white Indian COURT FEE label in fine unmounted mint condition overprinted BURMA in black. 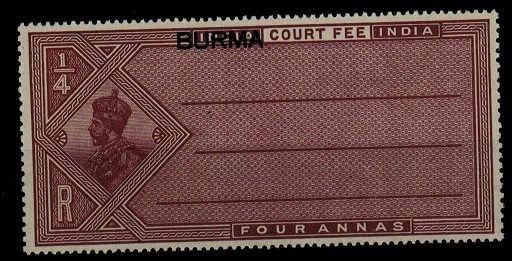 BURMA - 1913 1/4a COURT FEE adhesive unmounted mint. 1913 1/4 Rs purple on white Indian COURT FEE label in fine unmounted mint condition overprinted BURMA in black. 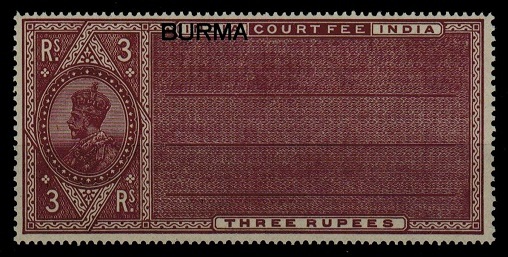 BURMA - 1913 1R COURT FEE adhesive unmounted mint. 1913 1 Rs purple on white Indian COURT FEE label in fine unmounted mint condition overprinted BURMA in black. 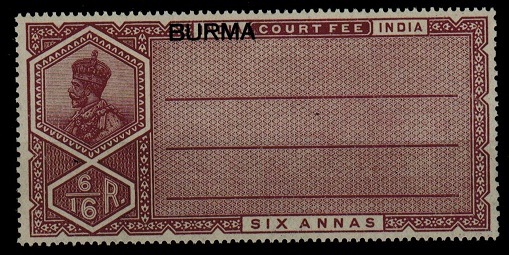 BURMA - 1913 1/2a COURT FEE adhesive unmounted mint. 1913 1/2 Rs purple on white Indian COURT FEE label in fine unmounted mint condition overprinted BURMA in black. BURMA - 1913 3Rs COURT FEE adhesive unmounted mint. 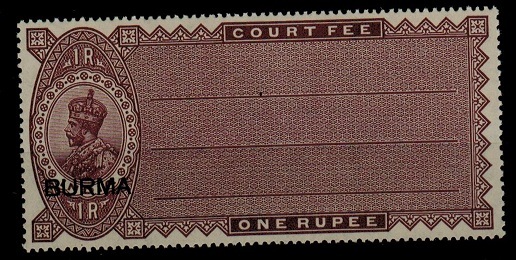 1913 3 Rs purple on white Indian COURT FEE label in fine unmounted mint condition overprinted BURMA in black.